Ya know, I was doing OK with the forecast for temps in the 30's for Christmas week, even though that is WAY cold for us this time of year. But this morning I was having a pleasant ride to work when the weather man on the radio said that nasty three syllable word. Nor'Easter. Are you flippin' kidding me? Coastal flooding! 50 mph winds! Snow! It hasn't started yet, but it's going to. I'm really disgusted with this weather. I seriously need to move further south. OK, I'm putting that aside and getting to the point of my post now. I stepped into the DAV Thrift yesterday to search for some tins for my homemade fudge gifts. Instead I found these two wonderful old plates. I'm so digging these plates, here is the stamp on the back. 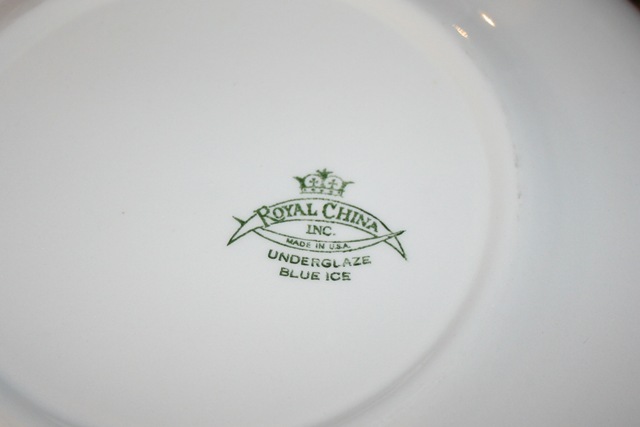 I don't know anything about Royal China, but I bet Mom Wald can tell me. She knows a lot about such things. I hope Mr Brady, the guitar teacher, appreciates his vintage plate. And the fudge. Those plates are great. I love the retro vibe and the snowy feel. 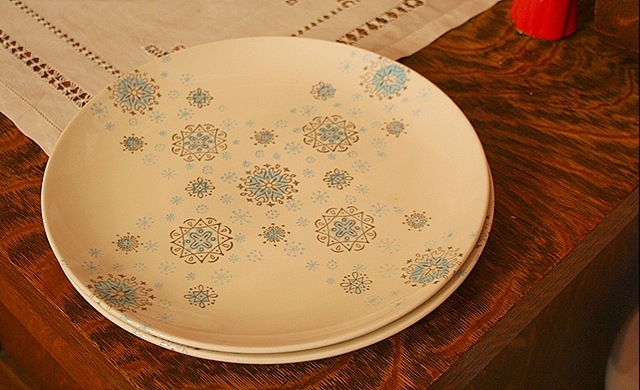 Every time I find a new plate pattern I like I get the urge to start collecting. How many patterns can a person collect before she is locked up? Stay warm! Love those plates and I would say yes to fudge! 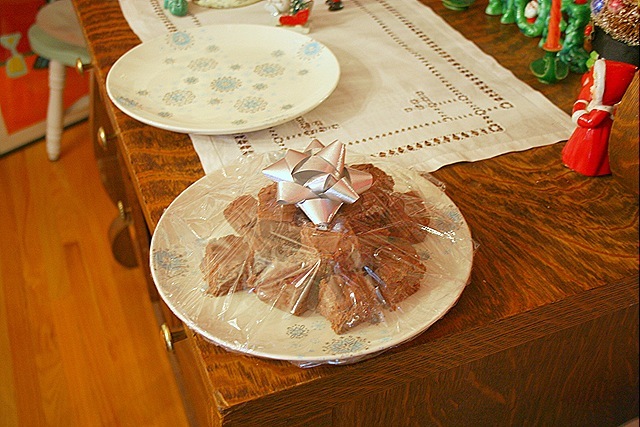 I keep a pattern when I love it and I find two plates since I set tablescapes for two but your idea of using vintage plates for gifts of fudge is wonderful. I’m in Georgia (near Atlanta) and I’m not looking forward to this weather. Keep safe! Oooh, “Blue Ice” what a find, and seasonal too! You are right, I love this stuff. “Lehner’s Encyclopedia of U.S. Marks on Pottery, Porcelain, and Clay” by Lois Lehner. Has a simple history of the Royal China Company. Wow, the only thing better than retro light blue starbursts are snowflakes! Nice gift, it’ll give him something to nosh during your storm. I NEVER find anything decent in my thrift store. I’m obviously shopping the wrong ones! Let us know if you get snowed in. Great plates, and I’m kinda jealous of that big storm. It’s supposed to just miss us. Good luck! Great find!! Yes, I knew Mom Wald would know!! I hope the storm doesn’t get too bad for you. We woke up to an inch or two of snow, but it quickly melted off of the streets.